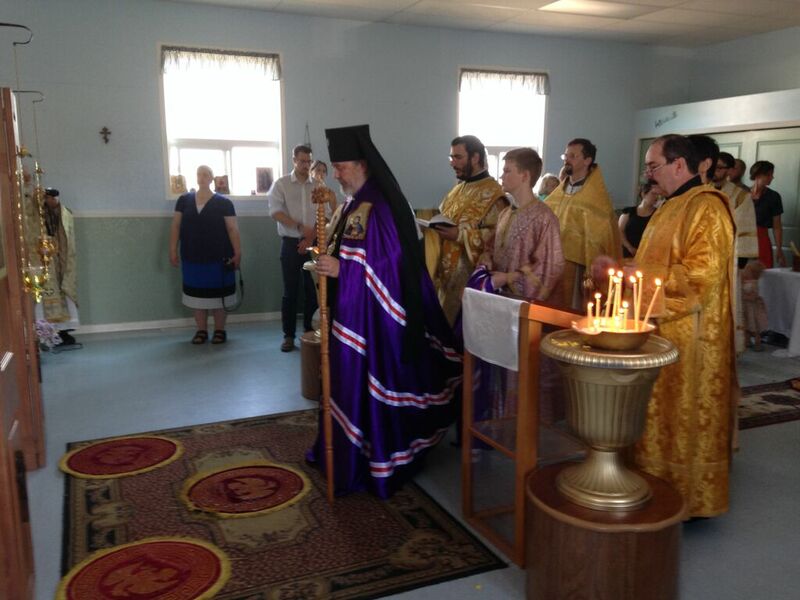 The Most Reverend Irénée, Archbishop of Ottawa and the Archdiocese of Canada, made his first Archpastoral visit to the Holy Apostles Mission Station in Chilliwack, BC, June 26-29th, 2015. Great Vespers, Matins, and the Divine Liturgy were served, for the Sunday commemorating the Holy Unmercenary Healers Cyrus and John, and the Holy Fathers Sergius and Herman of Valaam. At Great Vespers on Saturday evening, His Eminence received a family of four as Catechumens, preparing to enter the Church. His Eminence, Archbishop Irenee, prays the Entrance Prayers prior to the Divine Liturgy, at the Holy Apostles Mission Station, Chilliwack, BC. Concelebrating clergy included Fr. Matthew Francis, Priest in Charge of the Holy Apostles Mission, Fr. Richard Rene, Chaplain, Kent Institution, Fr. Leonard Herrem (All Saints, Meadow Lake, SK) Protodeacon Jesse Isaac, St. Herman of Alaska Sobor (Edmonton, Alberta), Deacon Phillip Ptashnik (BC Deanery), Subdeacon Barnabas Neufeld (Holy Apostles), Subdeacon Paul Bartlett (St. Aidan’s, Cranbrook, BC), Subdeacon Ryan (Tikhon) Bishop (St. Vladimir’s Seminary). During the Divine Liturgy, three members of the Mission Station were tonsured to serve as Readers in the holy Orthodox Church, and Fr. Richard Rene was awarded the Gold Cross, in recognition of his years of service to Christ and the Church. Several guests from other neighbouring parishes joined with us in honour of the special visit. The Mission was extraordinarily blessed to receive our Archbishop so soon after our foundation, and we were blessed with His Eminence’s prayers, teaching, and encouragement. We look forward to future visits, and to fulfilling our mission in the city of Chilliwack. Eis polla eti Despota!